Is intimate partner violence ever acceptable? Almost 40 years after the United Nations committed to ending violence against women in all its forms , the answer to that question should be a resounding no. But according to a new UN report , that’s far from the reality. 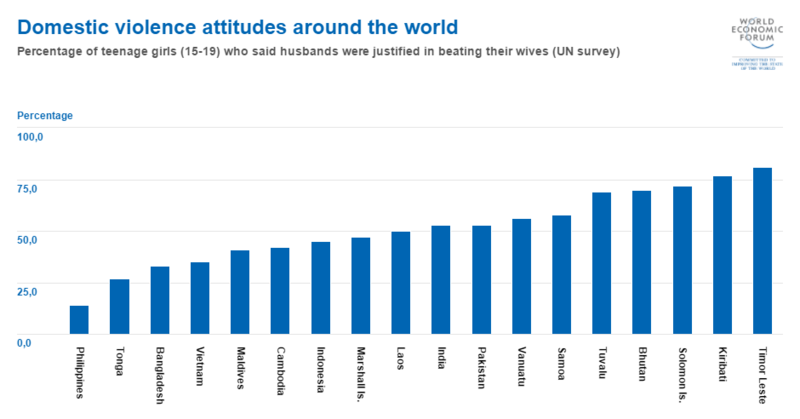 In Timor Leste, 81% of teenage girls believe a husband is justified in beating his wife for at least one reason. The figures were slightly lower for other countries in the region, but still attest to a worrying trend. In India, Pakistan and Bhutan, for example, over 50% of girls think domestic violence is acceptable in some circumstances. Interestingly, the report found that while many teenage boys in the Asia-Pacific region had similar attitudes to domestic violence, they were less likely to condone it: between 25% and 51% said that wife beating was justified in some situations. According to the report, which covers a range of issues related to the sexual health of young people in Asia-Pacific, low levels of education, unemployment and a family history of violence are all linked to acceptance of domestic violence. The findings back up data from the World’s Women 2015 , which revealed a shockingly high acceptance rate for domestic violence. In Ethiopia – where as many as 71% of women have been victims of domestic violence – 68.4% of women said intimate partner violence was acceptable in some circumstances, and 47.3% thought a husband should be allowed to beat his wife if she burns the food while cooking. Have you read? Ending violence against women: how far have we come? Where's the best place to be a woman? Could paternity leave help tackle gender violence?